Try to select the bookmark before the current one. Try to select the bookmark after the current one. References AP_JUMPTARGET_ANNOTATION, AP_JUMPTARGET_BOOKMARK, AP_JUMPTARGET_LINE, AP_JUMPTARGET_PAGE, AP_JUMPTARGET_XMLID, AP_UnixDialog_Goto__onBookmarkDblClicked(), AP_UnixDialog_Goto__onDeleteWindow(), AP_UnixDialog_Goto__onDialogResponse(), AP_UnixDialog_Goto__onFocusBookmarks(), AP_UnixDialog_Goto__onFocusLine(), AP_UnixDialog_Goto__onFocusPage(), AP_UnixDialog_Goto__onJumpClicked(), AP_UnixDialog_Goto__onLineChanged(), AP_UnixDialog_Goto__onNextClicked(), AP_UnixDialog_Goto__onPageChanged(), AP_UnixDialog_Goto__onPrevClicked(), AP_UnixDialog_Goto__onSwitchPage(), COLUMN_NAME, gchar, AP_Dialog_Goto::getJumpTargets(), XAP_App::getStringSet(), localizeLabel(), m_btClose, m_btJump, m_btNext, m_btPrev, m_iLineConnect, m_iPageConnect, m_lbAnnotations, m_lbBookmarks, m_lbLine, m_lbPage, m_lbXMLids, m_lvAnno, m_lvBookmarks, m_lvXMLIDs, m_nbNotebook, XAP_Dialog::m_pApp, m_sbLine, m_sbPage, m_wDialog, newDialogBuilder(), NUM_COLUMNS, setupAnnotationList(), setupXMLIDList(), targets, text, and UT_DEBUGMSG. References COLUMN_ANNO_ID, getSelectedUInt(), m_lvAnno, tostr(), and UT_DEBUGMSG. Get the label of the currently selected bookmark in the list. References COLUMN_NAME, getSelectedText(), m_lvBookmarks, and UT_DEBUGMSG. References COLUMN_NAME, getSelectedText(), m_lvXMLIDs, and UT_DEBUGMSG. If none is selected the first in the list is picked. Wraps around. References m_lvBookmarks, selectNext(), and UT_DEBUGMSG. If none is selected the last in the list is picked. Wraps around. References m_lvBookmarks, selectPrev(), and UT_DEBUGMSG. References COLUMN_NAME, AP_Dialog_Goto::ConstructWindowName(), AP_Dialog_Goto::getExistingBookmarksCount(), AP_Dialog_Goto::getNthExistingBookmark(), m_lvAnno, m_lvBookmarks, m_lvXMLIDs, m_wDialog, AP_Dialog_Goto::m_WindowName, updateAnnotationList(), updateDocCount(), updatePosition(), updateXMLIDList(), and UT_DEBUGMSG. Referenced by AP_UnixDialog_Goto__onDeleteWindow(), and AP_UnixDialog_Goto__onDialogResponse(). References _updateWindow(), m_JumpTarget, m_wDialog, UT_ASSERT, and UT_DEBUGMSG. Event handler for treeview "bookmarks". Event handler for button "jump". References _getSelectedAnnotationLabel(), _getSelectedBookmarkLabel(), _getSelectedXMLIDLabel(), AP_JUMPTARGET_ANNOTATION, AP_JUMPTARGET_BOOKMARK, AP_JUMPTARGET_LINE, AP_JUMPTARGET_PAGE, AP_JUMPTARGET_XMLID, m_iLineConnect, m_JumpTarget, m_sbLine, m_sbPage, AP_Dialog_Goto::performGoto(), text, tostr(), and UT_DEBUGMSG. Referenced by AP_UnixDialog_Goto__onJumpClicked(), onAnnoDblClicked(), onBookmarkDblClicked(), onLineChanged(), onNextClicked(), onPageChanged(), onPrevClicked(), and onXMLIDDblClicked(). Event handler for spinbutton "line". References line(), FV_DocCount::line, m_DocCount, m_JumpTarget, m_sbLine, onJumpClicked(), and UT_DEBUGMSG. Event handler for button "next". References _selectNextBookmark(), AP_JUMPTARGET_ANNOTATION, AP_JUMPTARGET_BOOKMARK, AP_JUMPTARGET_LINE, AP_JUMPTARGET_PAGE, AP_JUMPTARGET_XMLID, m_JumpTarget, m_lvAnno, m_lvXMLIDs, m_sbLine, m_sbPage, onJumpClicked(), selectNext(), and UT_DEBUGMSG. Event handler for spinbutton "page". References m_DocCount, m_JumpTarget, m_sbPage, onJumpClicked(), FV_DocCount::page, and UT_DEBUGMSG. Event handler for button "prev". References _selectPrevBookmark(), AP_JUMPTARGET_ANNOTATION, AP_JUMPTARGET_BOOKMARK, AP_JUMPTARGET_LINE, AP_JUMPTARGET_PAGE, AP_JUMPTARGET_XMLID, FV_DocCount::line, m_DocCount, m_JumpTarget, m_lvAnno, m_lvXMLIDs, m_sbLine, m_sbPage, onJumpClicked(), FV_DocCount::page, selectPrev(), and UT_DEBUGMSG. References AP_UnixDialog_Goto__onAnnoDblClicked(), AP_UnixDialog_Goto__onFocusAnno(), COLUMN_ANNO_ID, XAP_App::getStringSet(), XAP_StringSet::getValueUTF8(), id, XAP_Dialog::m_pApp, and NUM_ANNO_COLUMNS. References AP_UnixDialog_Goto__onFocusXMLIDs(), AP_UnixDialog_Goto__onXMLIDDblClicked(), COLUMN_NAME, and NUM_COLUMNS. 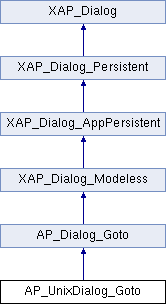 References COLUMN_ANNO_ID, COLUMN_ANNO_TITLE, FV_View::countAnnotations(), FV_View::getAnnotationAuthor(), FV_View::getAnnotationTitle(), AP_Dialog_Goto::getView(), tostr(), and UT_DEBUGMSG. Set jump target and update cached data like number of lines and pages. Referenced by AP_UnixDialog_Goto__onFocusAnno(), AP_UnixDialog_Goto__onFocusBookmarks(), AP_UnixDialog_Goto__onFocusLine(), AP_UnixDialog_Goto__onFocusPage(), and AP_UnixDialog_Goto__onFocusXMLIDs(). Update cached data like number of lines and pages. References FV_View::countWords(), AP_Dialog_Goto::getView(), FV_DocCount::line, m_DocCount, FV_DocCount::page, and UT_DEBUGMSG. Referenced by _updateWindow(), and updateCache(). References FV_View::getCurrentPageNumForStatusBar(), AP_Dialog_Goto::getView(), m_iLineConnect, m_iPageConnect, m_sbLine, and m_sbPage. Referenced by _updateWindow(), and AP_UnixDialog_Goto__onSwitchPage(). References COLUMN_NAME, AP_Dialog_Goto::getRDF(), and UT_DEBUGMSG. Referenced by onLineChanged(), onPageChanged(), onPrevClicked(), and updateDocCount(). Referenced by _constructWindow(), onJumpClicked(), and updatePosition(). Referenced by _constructWindow(), and updatePosition(). Referenced by notifyActiveFrame(), onAnnoDblClicked(), onBookmarkDblClicked(), onJumpClicked(), onLineChanged(), onNextClicked(), onPageChanged(), onPrevClicked(), onXMLIDDblClicked(), and updateCache(). Referenced by _constructWindow(), _getSelectedAnnotationLabel(), _updateWindow(), onNextClicked(), and onPrevClicked(). Referenced by _constructWindow(), _getSelectedBookmarkLabel(), _selectNextBookmark(), _selectPrevBookmark(), and _updateWindow(). Referenced by _constructWindow(), _getSelectedXMLIDLabel(), _updateWindow(), onNextClicked(), and onPrevClicked(). Referenced by _constructWindow(), onJumpClicked(), onLineChanged(), onNextClicked(), onPrevClicked(), and updatePosition(). Referenced by _constructWindow(), onJumpClicked(), onNextClicked(), onPageChanged(), onPrevClicked(), and updatePosition().